ODN/YouTubeThe blimp outside the Argentine Legislature. 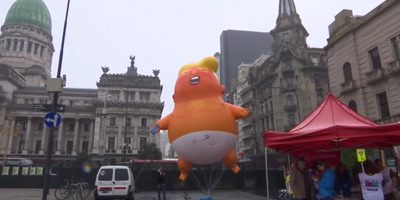 A giant blimp depicting President Donald Trump as a baby made him “feel unwelcome” when he went to London in July, he said. Trump is scheduled to meet with world leaders at the two-day event, but he said on Thursday that he wouldn’t meet with Russian President Vladimir Putin because of the situation in Ukraine. 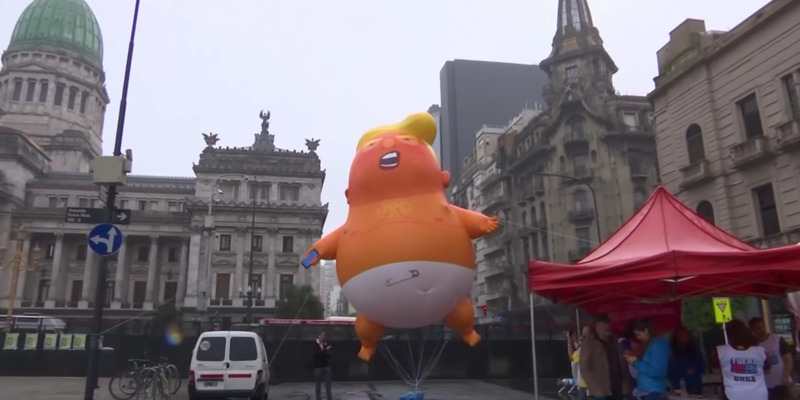 A giant blimp depicting President Donald Trump as a baby that he said made him “feel unwelcome” when it greeted him in London in July has followed him to the G20 summit in Argentina. Trump is expected to speak with several world leaders, including President Xi Jinping of China, though his itinerary has already been streamlined – on Thursday he tweeted that he would cancel a planned meeting with Russian President Vladimir Putin because of the situation in Ukraine. “Based on the fact that the ships and sailors have not been returned to Ukraine from Russia, I have decided it would be best for all parties concerned to cancel my previously scheduled meeting in Argentina with President Vladimir Putin,” he said in twotweets. Trump is staying for only 48 hours because he prefers his own bed and likes to keep his routines, according to The Associated Press. His tight schedule has forced a one-on-one meeting with Japanese Prime Minister Shinzo Abe into a “trilateral” with Indian Prime Minister Narendra Modi, the AP said. The blimp also followed Trump earlier this month to Paris, where the president was due to attend a World War I memorial but didn’t show up because of bad weather. The blimp cost £5,000 (about $US6,000) to make and was the brainchild of Matt Bonner, 36, from London.